Most energy systems are suboptimized. Businesses and consumers are so focused on initial costs that they underestimate the effect of operating the energy system over its life. This suboptimization creates a fantastic opportunity to not only make a wise decision financially but also reduce the environmental impact of energy systems. There are three simple tools, known to all mechanical engineers, that when added to traditional thermodynamics, enable an engineer to find the true optimum of an energy system. In this concise book, you will be equipped with these tools and will understand how they are applied to cooling systems. 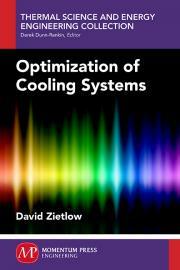 The target audiences for this book are mechanical engineering students in their first semester of thermodynamics through engineers with 20+ years of experience in the design of cooling systems. First semester thermodynamic students will benefit the most from Appendixes A and C in Chapter 1. The rest of Chapter 1 is written at a level where any undergraduate mechanical engineering student who is taking heat transfer will be able to quickly assimilate the knowledge. This book also has the depth to handle the latent load, which will provide the practicing engineer with the tools necessary to handle the complexity of real cooling systems. Dr. David C. Zietlow is a professor of mechanical engineering at Bradley University in Peoria, IL. He has been teaching thermodynamics since 2000. From 2005 to the present, he has equipped his first semester thermodynamic students with the tools they need to optimize energy systems. He has 12 years of industrial experience with Sargent and Lundy, Central Illinois Light Company, Ford Motor Company, and Visteon. He has published 11 journal articles and 14 referred conference papers in the thermal science field.